Remember The O.C.? And Laguna Beach, the reality show it inspired (which then led to The Hills)? I always think of those shows when I visit Orange County, where my boyfriend's mom lives, which is funny, because I've found it to be nothing like any of them. It's just a sunny stretch of southern California—yes, it's wealthy, but it's pretty laid-back for the most part. It just kind of feels suburban to me. The nice part, though, is that along the coast, the weather is perfectly temperate—even when it's blazing hot in the rest of Los Angeles, it's usually somewhere in the 70s with a cool breeze in Huntington Beach, where we shot these photos. Thus, my outfit is usually some combination of summer and fall. This is the first year in awhile that we won't be spending Thanksgiving weekend down south, but if we were, this is what I'd be wearing. 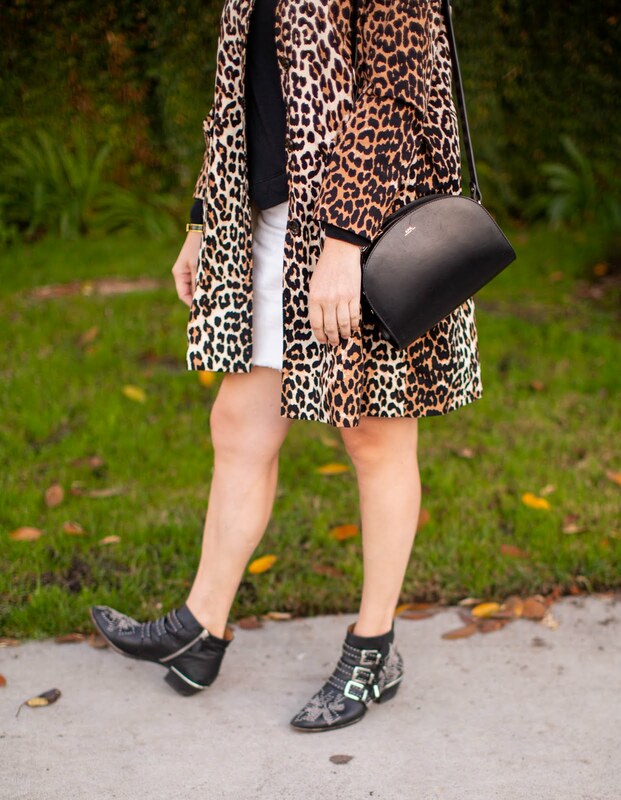 It's been awhile since you've seen this leopard coat (it was way back here), but I've found it to be a great weight for all parts of California. It's lightweight but lined, so it keeps out the chill. I also love the shape—it's just so flattering—and the print is spot on, pun intended. It's also been awhile since I've featured this Athleta top (most recently in this post). 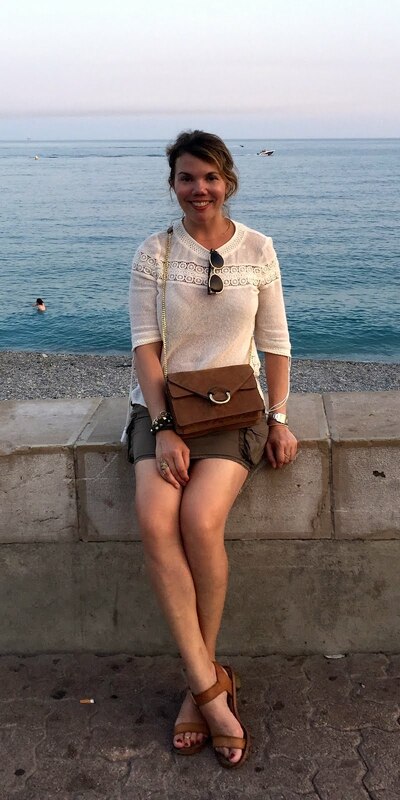 It is probably one of the top five tops I wear the most—the weight is perfect for year-round wear, and the crossover detail at the hem is just so flattering. I keep meaning to buy it in another color; I will probably do so during Athleta's Black Friday sale! I'm in a small here, for reference. You've also seen this white denim skirt before (most recently here), and yes, I am rebelling by wearing white long after Labor Day. But did you know that's a fake rule that department stores made up so people would buy fall clothes even when it's still hot outside? Anyway, I own this skirt in two colors—white and blue denim—and there's not much to say, other than I think the cut is perfect. Denim skirts are often too straight, but this one has a slight A-line shape to it, which I find more flattering. As with most Topshop styles, I went up a size (I'm in a US 8). I know, you're probably sick of my A.P.C. Sac Demi-Lune, but I'm not, so here it is again! (You last saw it here.) I just love it so much, I can't help but carry it constantly. Speaking of things I also love, it's been months since I've worn my Chloé Suzanna boots (last seen here), and now that it's finally cooling off, I was eager to wear them again. 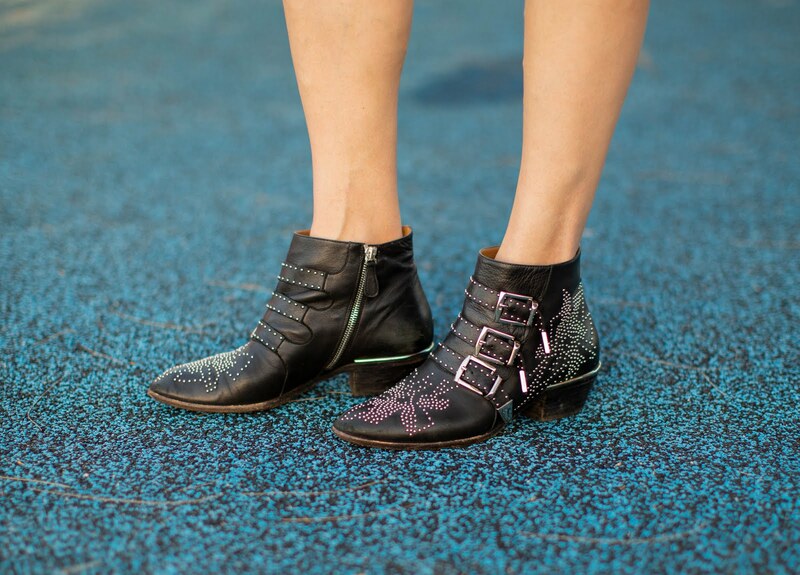 These boots are an investment, but they make whatever you're wearing look that much cooler. And I pair them with jeans, pants, dresses, skirts...everything. One thing to note: they run huge, so size down (I'm normally a 39 but wearing a 38 and they fit perfectly). We shot these photos in my boyfriend's mom's subdivision, which sits on a canal-type thing. It's not quite the mansions of The O.C., but I find it way more charming anyway. I will miss the southern California warmth this weekend, but we'll be back the following week! Still thinking about what you're going to wear this weekend? I've teamed up with some of my favorite bloggers to show you some super cute options. Read on for inspiration! ADA Elegance and Mommyhood "I cannot believe Thanksgiving is this week and then Black Friday, which means the Holiday craze has started. I am one of those 'lucky' ones that has to work all day on Black Friday, because the company I work for deals with sales among other things. For the small portion of the day when I do not work, you will find me bundled up in layers like my Abercrombie henley, Abercrombie fleece jacket, ponte skinnies, sneakers, the softest fleece scarf and a fleece beanie. And yes without realizing it, I wore yet another leopard hat. Happy Thanksgiving week, babes!" 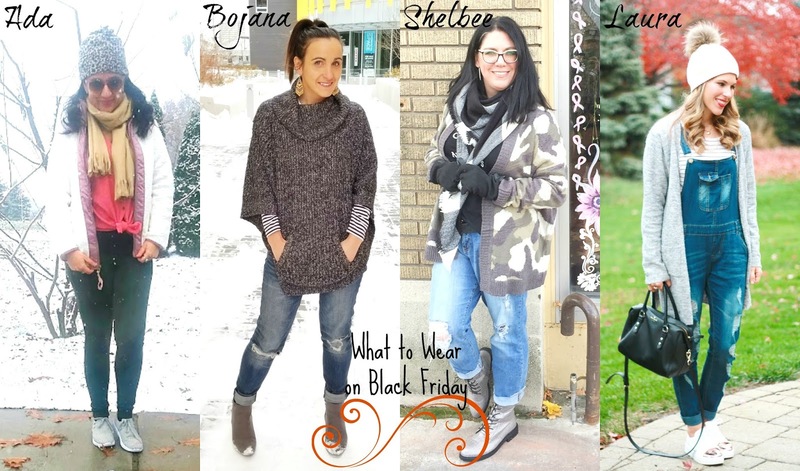 BOJANA Bo's Bodacious Blog "Jeans, boots, poncho comfort are my weekend jam. The poncho kept me cozy and warm, and my hands free while waking through the mall (I despise having to carry my coat around in the mall). The outfit was pretty tame so I added a little bling with these new Stella and Dot chandelier earrings. Love how it all came together and how the daylight cooperated for these pictures. " SHELBEE Shelbee on the Edge "I will be working all day on Black Friday: at the consignment shop from 10 a.m. until 5:00 p.m. then heading to the mall to work at Torrid from 5:30 until 10:30 p.m. So I need to be comfortable while donning my battle gear! I found this graphic tee which says “My coffee needs coffee” to be perfectly appropriate for working 12 hours on Black Friday. To be battle-ready, I went for a camo cardigan and plaid combat boots. Wish me luck! LAURA I Do deClaire "I don't normally head out on Black Friday. It's too chaotic and my introverted self gets overwhelmed with all the crowds. I like to be home, nice and warm and cozy, recover from Thanksgiving, and do some light online shopping if I have a chance! What could be better than overalls and a soft cardigan for a day at home?" AMBER Avec Amber "I know that many people have a four day weekend and roll right from Thanksgiving feasts to Black Friday shopping! My Black Friday outfit idea has this in mind with pieces that are both comfortable and cozy for the dropping temperatures...and leggings instead of pants, because real pants the day after Thanksgiving is just too aggressive." 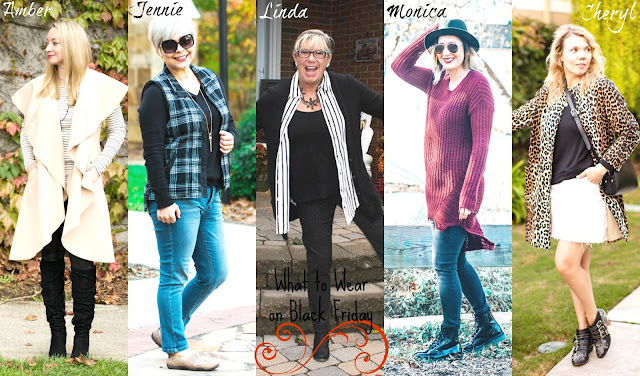 JENNIE A Pocketful of Polka Dots "When it comes to Black Friday shopping I am all about staying warm, being comfortable, and wearing things that are easy to get in and out of. A plaid vest layered over a simple sweater keep me warm and slide on sneakers make trying on clothes easy, while also helping me walk the distance. The great thing about wearing basics like a sweater and jeans is they work well while trying on other pieces, because if you are anything like me, Black Friday shopping inevitably means finding things for myself, too. ;) Gotta take advantage of those sales for All the important people on our list!" LINDA A Labour of Life "My Vanheusen Dot pants are so very comfortable and perfect for Black Friday Shopping. For me I will be working (aka Canadian) but comfy at my desk and surfing for awesome deals." MONICA Jersey Girl, Texan Heart "Can y'all believe that it is already that time of year? The madness of Black Friday shopping is upon us! I usually don't go out shopping on Black Friday, but whenever I do, I'm always there later in the day in something super comfy, because I'm still stuffed from Thanksgiving dinner the night before. Here is my winter uniform! A sweater, some comfy pants, boots, and a hat." CHERYL Cheryl Shops "Normally I'm down in Los Angeles for Thanksgiving—and California has been having unseasonably warm, dry weather—so this is what I'd wear on Black Friday. It's kind of half summer and half fall, but these are some of my favorite pieces that I've featured this year on Cheryl Shops. The accessories are key for Black Friday bargain hunting: the crossbody purse allows you to go hands-free, and the low-heeled boots are comfy enough to be on your feet for hours. Happy shopping!" Love this coat for the fall! This leopard coat is such a fun piece! Cheryl, this coat is amazing and I am dying over your booties! Such a great outfit for Thanksgiving or any day really! Wishing you a very happy and relaxing holiday! Oh boy, I am lusting after those booties! they look awesome. Love the detailing and the buckles. fun! Of course I love your leopard jacket, such a pretty look! Thanks for joining us at The Wednesday Link Up. Your leopard print coat is fabulous, and those boots are stunning! Thanks for linking up!